Nutro Wild Frontier Dry Food for Puppies offers a grain free, high protein diet that will support your puppy’s rapid growth and give them everything they need in the early stages of their life. 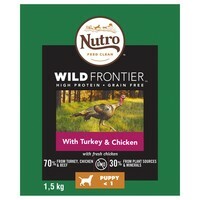 Designed to imitate the diet your puppy’s ancestors would have eaten in the wild, Nutro Wild Frontier contains 70% animal ingredients from protein rich sources such as Turkey and Chicken. Nutro Wild Frontier also contains a healthy level of carbohydrates to meet your puppy’s essential growing needs and gives them the energy and nutrition they need to play out their wild instincts.